Heat oven to 350°F. Line cookie sheet with cooking parchment paper. In large bowl, beat cookie mix, granulated sugar, butter, almond paste and egg with electric mixer on low speed until soft dough forms. 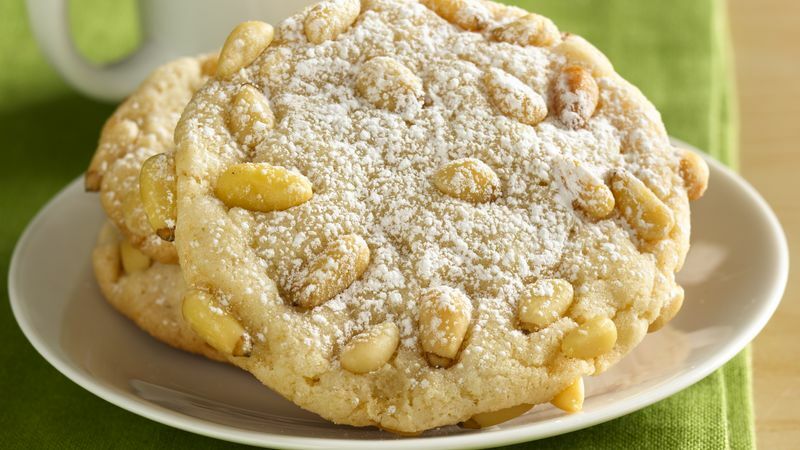 For each cookie, shape 1 tablespoon dough into ball; roll in pine nuts, pressing to coat. Place balls 2 inches apart on cookie sheets. Bake 13 to 17 minutes or just until edges are light golden brown. Cool 5 minutes; remove from cookie sheets to cooling racks. Cool completely, about 15 minutes. Before serving, sprinkle with powdered sugar. Look for pine nuts in the grocery store near the other nuts. Look for budget-priced pine nuts in the bulk-foods section of the store or in club stores. Pignoli ("peen-YOH-lee") is the Italian word for pine nut. The long process used to extract the nuts from the cones makes them expensive.